Alex Hughes– October 2018… Finding a Mexican grocery store in Oceanside resulted in various results including Five Star Market. It was towards the San Luis Rey area of Oceanside which was not too far from home by car at least. I took the 302 from Vista Transit and walked across the street trying not to get hit. Some drivers were testing out their engines a bit too much. The store’s sign is quite visible from the sidewalk as it stretches above several of the windows. It was a darker red and at least was different than the commonly seen bull reference. 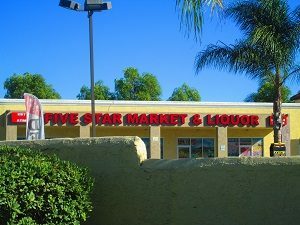 The name reminded me of another market called Five Star Market on East Vista Way which has now been abandoned. I wonder if it was the same place? After getting some shots from the sidewalk, I walked through the parking lot. The windows out front were covered with canvas and images of various products that you could buy such as liquor, fruits and vegetables and cereals. There was an image of a farm in the back for the fruit to represent freshness. There was also a claim of local selection from California. They certainly were not shy to show off their alcohol selection with that being the first image seen from the left. It was also the biggest one with two windows being dedicated to it. My favorite was the deli which showed Mexican cheeses and cut meats. At least, they did not worry about PC culture with a Mexican guy with a large mustache and sombrero. Funny. Inside was quite large with the roof seeming to stretch above me. The left side of the store was dedicated to the counter where transactions were done including the alcohol and tobacco. It reminded of Eddie’s Market and Liquor on East Vista Way. I took a look at some of the produce spread about across from this area and noticed the general ripeness. It seems that the fruits were a bit off and would spoil if I bought them. They did have a refrigerator section dedicated to more fruits and vegetables. This is where I found some nectarines and strawberries wrapped in a green plastic mesh basket. Arriving home, I found the strawberries to be quite juicy, and the nectarines brown a few days after my visit. Another item that I was searching for was dried beans which my grandma instructed me to buy. I found several dry goods sections that were stacked high; I had to stretch my neck to see just how much was there. I did find some good priced beans. Granted, I had tried all different types already. I was sort of wary especially after find some that expired some time ago. I got out of those middle sections and saw that a line had formed: quite busy as it stretched through the midsection of produce. I took a peek near the deli and found some tortillas. I got some Esperanza’s from Escondido and searched from chili seasoning from Pico de Gallo brand which is better than Tajin. It is too crunchy for my tastes. They did not have this elusive seasoning, so I decided to look at their drinks. I was thirsty from the summer heat and found some canned Perrier which seemed out of place especially in a can. I am used to seeing those green glass bottles that look like a genie’s lamp. What was unique about this was that it had fruity flavors and no added sugar. That seemed like a miracle! I had not drank soda for years because of how unhealthy it is, but this was the solution. I paid up front. The list of what I bought is down below. P.S. I did not enjoy the Perrier by itself. It still had that very bitter chemical flavor that I remembered as a child. The natural flavors did not help. That is why I decided to add it to some orange juice to get myself a mock soda: 100% juice with no added sugar. I wonder why the soda companies don’t try this.